Considering the significant interest from my previous post, Great Expectations: A 2017 Market Forecast, particularly the chart detailing average sales price per unit amounts, I felt it necessary to expand the analysis to include the major Western MSA's, excluding Los Angeles and San Francisco. 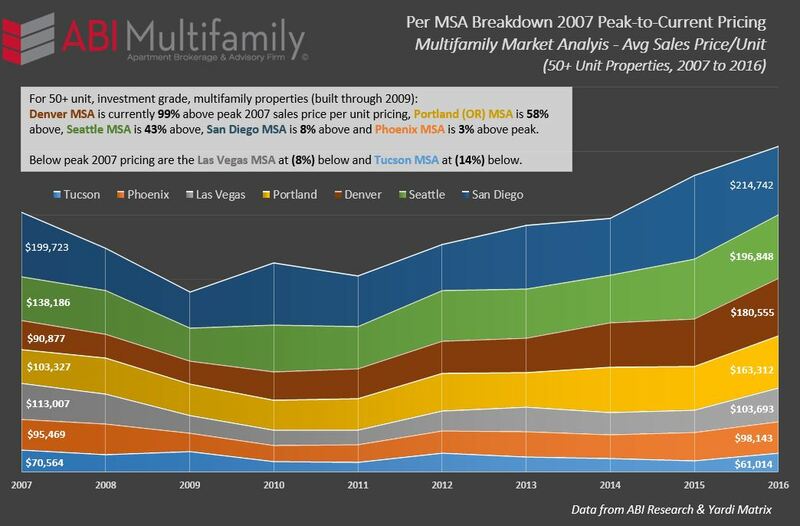 As referenced in the chart, which is ordered by highest current price per unit amounts (on the right side of the chart), most of the Western MSA's have broken their previous 2007 peak price per unit records with the exception of the Las Vegas and Tucson MSA's. It should be noted that not all year built types are exceeding their previous peaks even in MSA's where average aggregate sales price-per-unit amounts have. For example, in Phoenix, currently 3% above its average 2007-peak, Pre-1980's, 1990-99 and 2000-09 built product are still below their previous peak at (2%), (4%) and (6%) respectively. When taken in aggregate, sans Los Angeles and San Francisco, the West is nearly 26% above peak 2007 pricing having experienced 10%+ price-per-unit appreciation rates from its 2009/10 nadir through 2016. If 2005 was the last year of ‘sane' investment/building, what would the price per unit be now if average price-per-unit growth was a more modest 3% per annum, compounded? The answer, to say the least, was very surprising. For Phoenix, the average price per unit sold in 2005 was $67,199. If we take 3% growth (from 2005 thru end of 2016), compounded annually, the projected price-per-unit would be $95,810. Our current price is $98,143, is only 2.5% greater. The same holds true for much of the Western US as a whole. First, and I think it's rather obvious from the graph below, is population growth. The Western US, with an average growth rate of approximately 30% is two times higher than that of the US as a whole over the same 15 year time period. 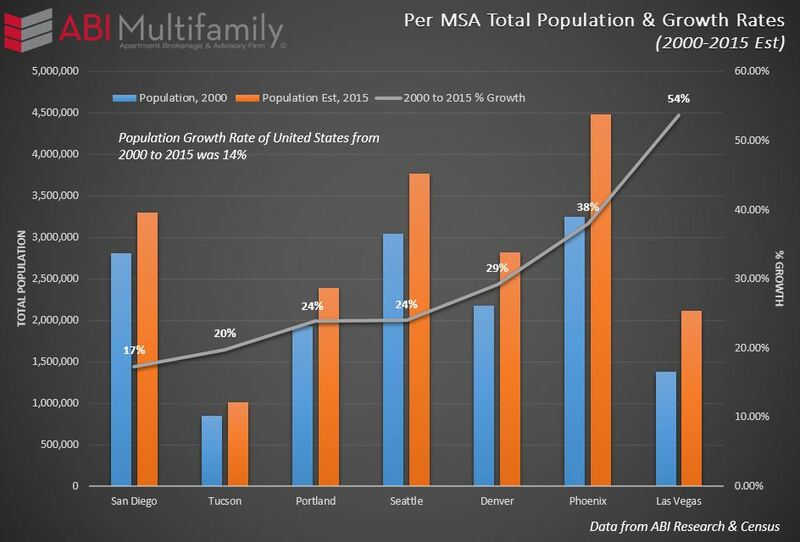 As we drill down on specific MSAs, Las Vegas has witnessed the greatest percentage increase at 54%, followed by Phoenix at 38% and Denver at 29%. As stated and explained over the last several posts, it is highly unlikely the Fed will increase interest rates in 2017. This sentiment was further reinforced by the FOMC's recent February meeting in which they acknowledged rising inflation but maintained their near decade long modus operandi of wait-and-see. This juxtaposed to the recent addition of very-to-leaning dovish new Fed voting members including; Chicago Fed President Charles Evans, Dallas Fed President Robert Kaplan, Minneapolis Fed President Neel Kashkari and Philadelphia Fed President Patrick Harker, seem to all but guarantee limited, if any, hikes over this next year. This isn't to say that 2017 shall be uneventful, or less volatile, rather the events potentially confounding investors will be external, think trade/international relations and all its implications, than internal, rising interest rates. In areas already operating in sub 5 CAP rate environments, particularly acute in the coastal regions, should see investors searching for value in either more attractive coastal areas, such as San Diego, or the high population/job growth areas of the Southwest and Southeast.